All you know very well from February 1, 2019 rules of the cable and DTH updated by the Telecom Regulatory Authority of India (TRAI). TRAI channel selector application launched which help the users to select preferred channels and know updated monthly rental. Before cross the last date, select your favourite channels and update your pack. TRAI has launched a new web application to simplify the channel selection process. This guide helps you how could you use TRAI channel selector application and choose required channels. If you still note selected your DTH or Cable channels or have any confusion in the price, just read this article will helps you to resolve your all issues. Past all the rules of cable and DTH operators has been replaced by the TRAI which is effective from 1 February 2019. You must have to select your required channels, update your pack, and pay the fess of only those channels which you want to view only. You can select your channels either from call at your DTH customer care number or update channels list from your DTH service provider website. The TRAI Channel Selector Application will understand the user’s choice and show the list of channels. Also, whatever channel you want to select, the MRP will also be shown. This application will ask few simple questions with the users. On this basis of these questions and answer, it will show the list of channels of his choice in-front of the user. With this new application of TRAI, users will also know the about the updated monthly rental. 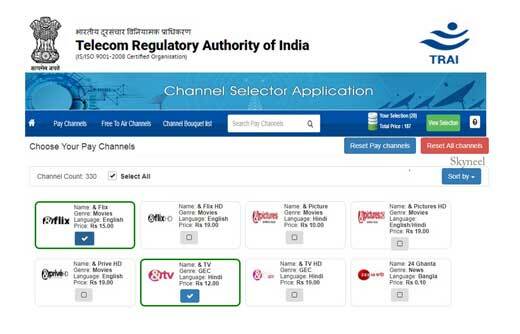 If you still confusing and yet to not select the channel, use TRAI channel selector application. You can also check each channel price at your TV screen, you can also check required channel prices in SD or HD type. Step 1: To use TRAI Channel Selector Application, you need to go to TRAI Website. Click on the Get started button and fill your name in the next dialog box, then click on “Continue” button. It’s an optional entry, if you don’t want to fill your name fill click on the “Skip” button. Step 2: In next screen select your state in which you want to select required channels. It’s an optional entry click on the Skip button, if you don’t want to fill them. Step 3: Select your preferred language in which you want to view your channels. You may select any one or all Languages and click on the “Continue” button. You can also skip this process, by clicking on the “Skip” button. Step 4: You can get different categories like News, Music, Sports, Lifestyle, Miscellaneous, Devotional, Infotainment, Movies, Kids and General Entertainment (GEC). Select your required one or more categories as per your need in next screen and click on the “Continue” button. Step 5: Select channel type, there are two types of channels HD & SD. Either you can select any one or select both channel types as per your need and click on the “Continue” button. Click on the OK button. Step 5: Now, you will get list of all the channels as per select your language, categories, channel type etc. You can check channel name, type, language and price separably. Choose required more than one channels which you want to view. Step 6: Click on the “View Selection” button to view list of all selected channels, price, network capacity fees, GST@18 percent and total monthly rental. Now, click on the “Optimize” button. It’ll ask for your final confirmation just click on the OK button. Click on the OK button and take printout and call or mail the list of selected channels to your TV service provider. You can also call at your TV service provider customer care number and ask them to set these selected channels. So, why you are waiting immediately select your preferred channels which you want to view and update your DTH or Cable monthly rent. If you have any query regarding this article please write us in the comment box.